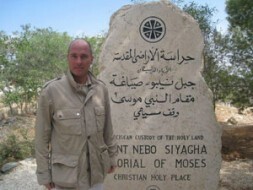 World Security Network Foundation founder Dr. Hubertus Hoffmann on mount Nebo in the Holy Land, one of the Christian Holy Places, where prophet Moses according to Jewish and Christian tradition was burried by God Himself: "In reality, Israel has no strategy but a pragmatic show of strength. It is about to lose the battle for its existence in the long-term. Israel is only focused on the hard factors of peace-making, like killing enemies and containment. It lacks the more important soft factor of peace-making: a reconciliation process with the Palestine people, a new détente with the Arab world. Israel should carefully plan and implement a new reconciliation policy with the Palestinians as an equally important pillar of its security." Israel is at a crossroads. Do they lose one friend after another - including the U.S. and many European countries - or start a new way of thinking, a new double strategy of power and reconciliation. It has existed only for 60 years; the Crusaders lasted 200 years even while their Kingdom of Jerusalem gradually reduced from 1099 to 1291, with Jerusalem already lost in 1187 to Saladin. The same happened with the Crusaders in the 12th century: after many years of peaceful co-existence came radical and confrontational leaders like Guy of Lusignam and Raynold of Chatillon - along with death and destruction. The Crusaders never understood the art of peace-making. For too long Israel has been held hostage by both the nationalist wings in its politics, for example the Shas party, an ally of Prime Minister Netanyahu, and its traditional bunker mentality. In reality, Israel has no strategy but a pragmatic show of strength. It is about to lose the battle for its existence in the long-term. Israel is only focused on the hard factors of peace-making, like killing enemies and containment. It lacks the more important soft factor of peace-making: a reconciliation process with the Palestine people, a new détente with the Arab world. This would not be weakness, but cleverness and necessity. Or as Eric Hoffer once said: "A war is only won after you have turned your enemy into a friend." Israel should carefully plan and implement a new reconciliation policy with the Palestinians as an equally important pillar of its security. Israel and the world have to stop the radicals on both sides, and give peace a chance - now!